Are you desperately tired with a baby that just won’t sleep? Read on to find the solution. One of the biggest problems that most parents face is sleep, or lack of it. Newborns are notoriously good at keeping their parents awake all hours of the day and night, but many parents report that their babies of all ages still wake repeatedly when they really wish they would sleep. It is hard, really hard. If you are one of these parents, it will leave you feeling like a zombie and wondering how you will ever function as an actual human being. If you were sleeping for most of the day, would you want to sleep all night too? (I’m not talking about tonight. If you’re reading this, it is probably because you are desperate for sleep, so a the moment you probably feel that you could sleep all day and all night.) Usually, a person, baby or adult, will need a certain amount of sleep within a 24 hour period. So how do you gently encourage your baby to have the majority of their sleep during the hours of darkness? And enough consecutive hours for you to be able to function as a normal human being in the morning? It’s about when they eat too. I remember when my youngest son was up loads in the night when he was tiny (before I discovered these life-saving routines), I used to eat a Kit Kat in the middle of the night to keep myself awake. 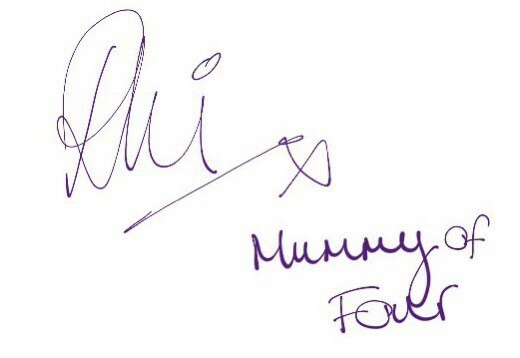 Soon enough, I would wake up and start to feel hungry at that same time every night, whether my son was awake or not. Eating was not really a necessity at that time, it was just becoming a habit. If I had started eating full meals during the night, would I have been hungry enough to eat my normal sized meals during the day? Probably not. So I would have ended up in a situation where I was not eating enough during the day and would be starving at night. It would become a vicious cycle and, eventually, I would be consuming most of my calories at night, rather than sleeping. Babies are no different. If your baby is eating at the right time and sleeping at the right time during the day, their night time sleep will naturally improve. Eating at the right times – your baby needs to gradually be encouraged to consume the majority of their calories during the day. 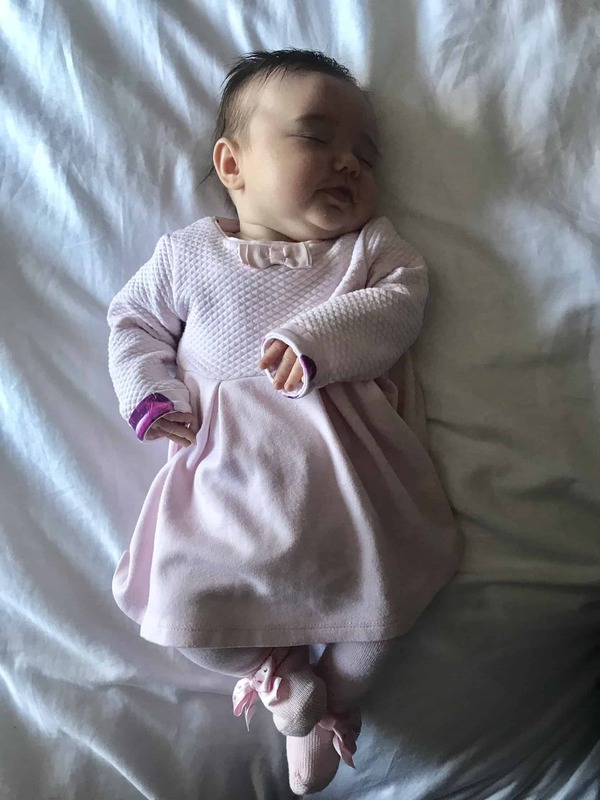 Not sleeping too much during the day – if your baby is sleeping too much during the day, they will not want to sleep at night when you need to sleep. 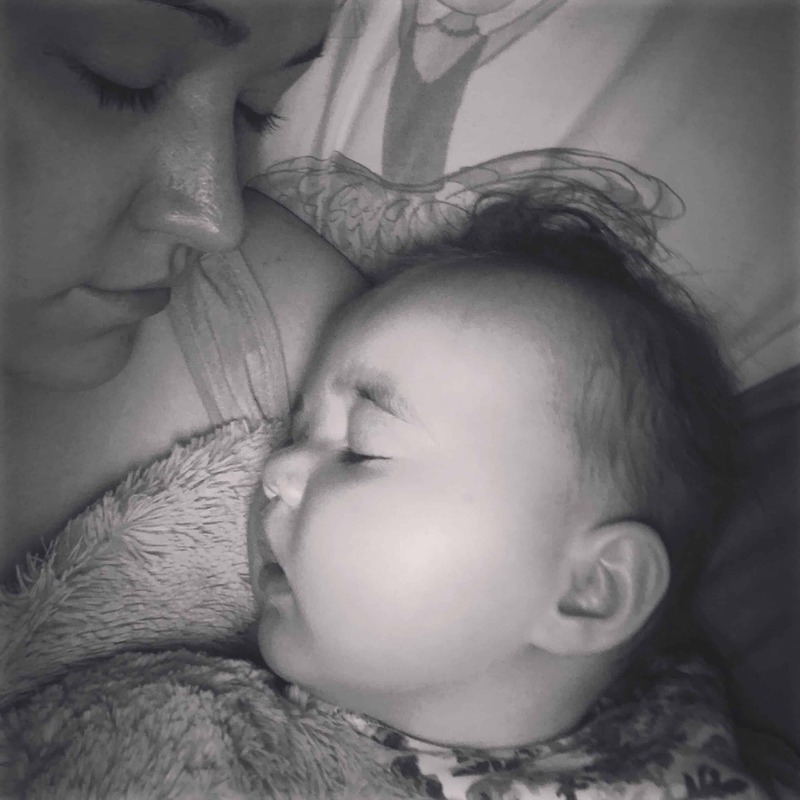 Sleeping at the right times during the day – nap times need to be structured to encourage your baby to be ready for a block of night time sleep come bed time. 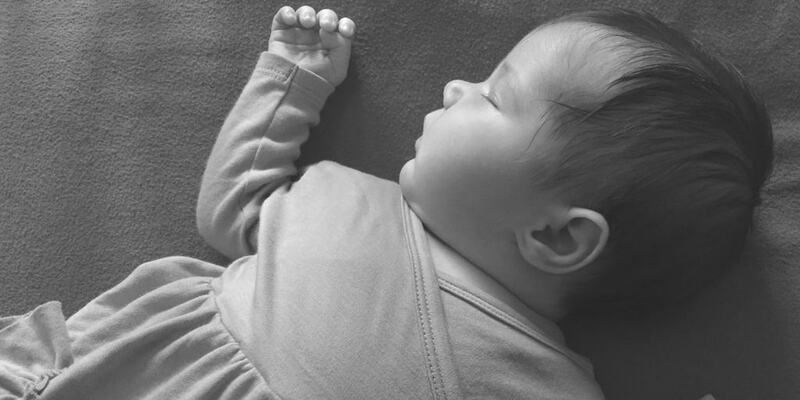 Not sleeping enough during the day – an over tired baby will often resist sleep, even though they desperately need it. Can Newborn Babies Follow A Routine? Newborn babies are not yet ready for a routine, but can follow a schedule. They need to be fed every 3 hours from the beginning of the feed between 6am and midnight, this is the only way to help them thrive even with their tiny tummies. To start with, you should offer 5 minutes on each breast. Increase this by a few minutes each day until your milk comes in. Once your colostrum is replaced my milk, encourage baby to suckle for longer at the breast. Make sure that the first breast is emptied before moving to the second breast and increase suckling time gradually each day. You should aim to feed baby for around 25 minutes of the first breast, then offer 5 -10 minutes in the second. For more information about breastfeeding, check out my Things That Every Parent Should Know About Breastfeeding post. When Can Your Baby Move On To More Structured Routines? has regained their birth weight and you health visitor is happy with their weight gain. is feeding well and being encourage to empty the first breast before being offered the second. This will ensure that they reach the calorific hind milk. You can read more about this in my Doing This One Thing While Breastfeeding Will Help You Get More Sleep post. is going 3 hours (counted from the beginning of the last feed) without becoming distressed due to hunger. What Sort Of Routine Should Your Baby Be Following? 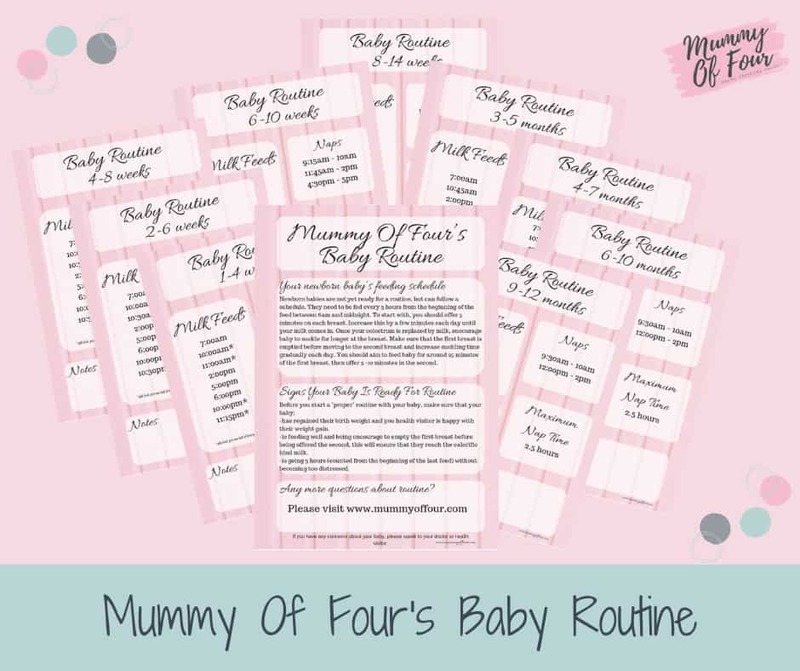 For full details of the specific feeding times that suit babies of various ages, you can download my handy printable routine sheet. Babies will need to shorten the length of each nap as they get older, dropping the afternoon nap first, then the morning nap. The lunch time nap is the core nap and will be the very last nap to be dropped as your baby becomes a toddler. So give it a go! Download the PDF guide and start following the timings with your baby. 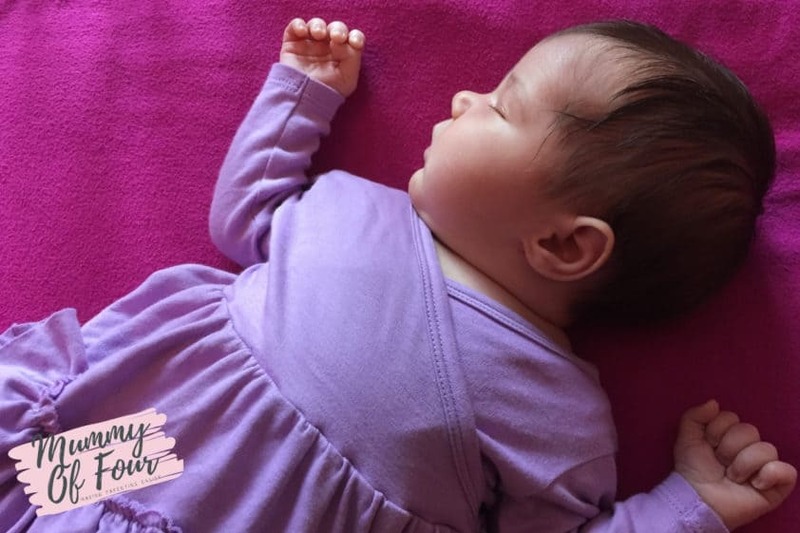 If you are new to routines, or your baby’s sleep has taken a backwards step, start with the youngest age bracket routine that your baby will fit into. Start with eating at the right times and waking them up at the right times. Gradually, if you follow the routine, your baby will start to sleep less in the day and for longer stretches at night (so that you can too). Oh my goodness, I remember the routines so well with my eldest (and lack thereof with my subsequent two!) I could never manage to have any routine at all with them. You’ve lots of great tips here! Some mums I know have got on well with routines but it wasn’t for us. We’d have it down for a few days then everything would change. We just fed on demand and I safely co slept to make sure we got enough sleep. I only have the one though so I suppose it’s easier to go with the flow. My son was a terrible sleeper. My husband and I were exhausted until Susan Urban’s guide ‘how to teach a baby to fall asleep alone’ ( got it here: http://www.parental-love and I’m sure it’s also available on Amazon). The technique in this guide gave my family desperately needed sleep in just a few days without any drama. I’m not a person who response a lot on the internet but I know how difficult this subject is and I’m sure that this guide will help you guys as well. Good luck! A really useful guide to baby and toddler sleep. Simply written and easy to follow. And most importantly: it’s working!! I’m just after trying the method from Urban’s guide and I love it 🙂 Thanks for sharing the link!! i’m also in susan’s fanclub 🙂 got this guide from my friend and it worked so quick! i tried friday evening and the sunday night was already calm. amazing. everyone should know this method! I’m so glad I stopped by to read the article and the comments and that I purchased How to reach a baby to fall asleep alone guide! Life is beautiful when your baby sleeps! I had to learn routine for my own to make it work for my baby boy! I got the book about sleep training from my friend. It was the best baby-gift ever! Even though the method is since the month 4 there are tips to follow for the first months too. 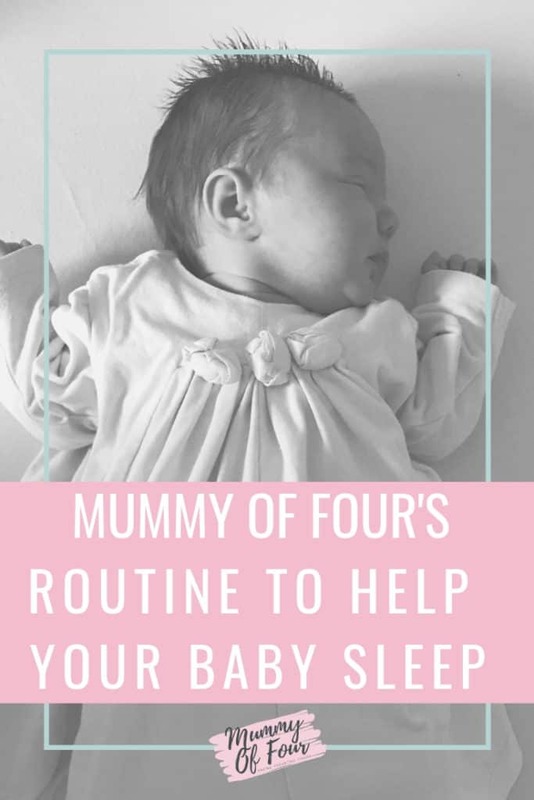 So we managed to establish the routine since the begging and when the time came – just in 3 nights teach my boy to self-sooth and fall asleep in hif crib without rocking. It is called HWL method by Susan Urban (www.parental-love.com) and it worked amazingly! But yes – routine is a key to success.